Chocochip is made to please all chocolate lovers' tongue. 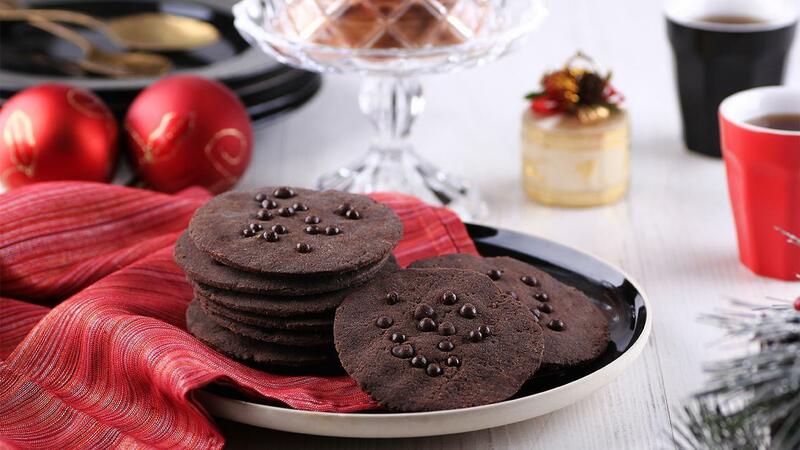 The soft and melt sensation in our tongue will be stronger to feel with crunchy thin cookies. What a perfect combination! WhiskBlue margarine and icing sugar together until the dough expands by half. Then, add evaporated milk, custard powder, baking powder, chocolate powder, black charcoal and mocha coffee and whisk them well. Next, add medium/low protein flour and Knorr Mashed Potato and mix them well. Leave the dough for 15 minutes until all ingredients are perfectly blended. Mold the dough using circle molds and add some chocolate chips on top. Bake them in the oven at 175°C and at 150°C in the convection oven.